...can you see what I see?! We've actually been testing since Sunday, per my sweet husband's prodding. I told him this was useless so early, but whatever. We still had like six of the cheapo tests. Nothing, nothing, nothing. And then yesterday morning, after seeing nothing, I thought I saw the faintest hint of a 2nd line when I was later throwing away the test. I mean, anyone less neurotic would not have seen it. And I convinced myself that it meant nothing. I was feeling crappy yesterday and starting to spot. I was beginning to think this indeed was another bust. But this morning we clearly got two positives - one on el cheapo test and one on First Response. You can definitely see the 2nd lines here in the pic but it's more clear in person - I promise. I keep looking at them to make sure I'm not hallucinating. I think I asked the hub, "do you see them?" like 50 times. Ahhh... still in total shock right now I think. I absolutely detest taking HPT's, so to see two lines this morning was pretty unreal. It's been two years since we've seen a positive. 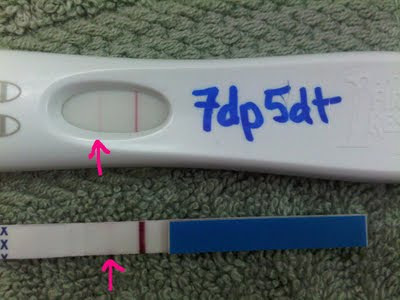 Even with our last chemical pregnancy on the 1st IVF round, we were never able to get a positive on a home test. So this is definitely progress! Of course it's early, anything can happen, yada yada yada... we know that all too well. But this is a step in the right direction and we will celebrate every step! Thanks again for all the prayers and encouragement along the way. And yeah, I promise I'll get the pics and video, etc from the transfer up at some point. As many of y'all know, blogger was a mess last week and I just haven't gotten around to it this week yet. Hopefully tonight! Shutup!!!! It's very clear! What happens next? Said it before, I'll say it again... OH EM GEE!!!! SO EXCITED!!!! Those are most definitely preg-positive. WOO HOO!!!!!!!!!!!!!!!!!!!!!!!!!!!!!!!!!!!!!!!!!!!!!!!!!!!!!!!!!!!!!!!!!!!!!!!!!!!!!!!!!!!!!!!!!!!!!!!!!!!!!!!!!!!!!!!!!!!!!!!!!!!!!!!!!!!!!!!!! Praise God!!!!!!!!!!!!!!!!!!!! Celebrating each step with you!!! Woo HOO!!!! Yippee!!!! I don't even have to stand on my head to see that second line! SO excited. :) Actually just screeched out loud, and I am the only one home....Great step in the right direction!!! OMG! I think I was literally as excited to see those two lines as I was for my own positive test! congratulations! Oh my gosh!!! How exciting!! Continued prayers you way! I'm so excited for you!!! Praying for continued good news and good health! Yayyyyyyy!!!! That is so exciting! Congrats!!!! I will continue to pray for you!!! Go go go go! All engines go! btw- I am totally on team twins! Pretty pumped. I got goosebumps. Trying not to get ahead of myself, but I know you have to have the same smile I am wearing today! Love you and your two super-awesome lines! Coming out of lurkdom to say congratulations! Very exciting news. I wish you continued blessings with each passing day! Wow!!!!! Congrats- so excited for you! Congratulations! I am a brand new follower but I could not be more excited for you. My husband and I have been trying to have a baby since April 2008. We have been pretty much taking a break from fertiliy stuff for the past year. I can't wait to follow a long. GIRL! So exciting. Yes celebrate every step! PRAYING! So very exciting!!! CONGRATS!!! Praying for a very Happy coming 9 months!!! Soooo excited!! LOVE LOVE you. Ok Betty...a day at a time, a step at a time. Praising HIM for your good news!! Wow, What fab news. My husband and I are Praying for you both every step of the way. We are in Aus and seeing this as I am about to leave for work has made my day. Nothing better than 2 pink lines.